Children who read for pleasure are likely to do significantly better at school than their peers, according to new research from the Institute of Education (IOE). The IOE study, which is believed to be the first to examine the effect of reading for pleasure on cognitive development over time, found that children who read for pleasure made more progress in maths, vocabulary and spelling between the ages of 10 and 16 than those who rarely read. The research was conducted by Dr Alice Sullivan and Matt Brown, who analysed the reading behaviour of approximately 6,000 young people being followed by the 1970 British Cohort Study, which is funded by the Economic and Social Research Council. They looked at how often the teenagers read during childhood and their test results in maths, vocabulary and spelling at ages 5, 10 and 16. The researchers, who are based in the IOE’s Centre for Longitudinal Studies, compared children from the same social backgrounds who had achieved the same test scores as each other both at ages 5 and 10. They discovered that those who read books often at age 10 and more than once a week at age 16 gained higher results in all three tests at age 16 than those who read less regularly. Perhaps surprisingly, reading for pleasure was found to be more important for children’s cognitive development between ages 10 and 16 than their parents’ level of education. The combined effect on children’s progress of reading books often, going to the library regularly and reading newspapers at 16 was four times greater than the advantage children gained from having a parent with a degree. Children who were read to regularly by their parents at age 5 performed better in all three tests at age 16 than those who were not helped in this way. 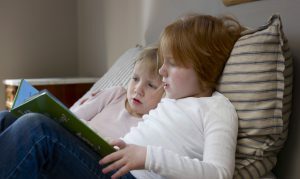 The study also found that having older siblings had a negative effect on children’s test scores in all three subject areas but particularly for vocabulary. Having younger siblings had less effect on test performance but was linked to lower vocabulary scores. The researchers suggest this may be because children in larger families spend less time in one-to-one conversations with their parents and therefore have less opportunity to develop their vocabularies. Dr Sullivan says this study underlines the importance of encouraging children to read – even in the digital age. “There are concerns that young people’s reading for pleasure has declined. There could be various reasons for this, including more time spent in organised activities, more homework, and of course more time spent online,” she said. ‘Social inequalities in cognitive scores at age 16: The role of reading’, by Alice Sullivan and Matt Brown, is the latest paper to be published in the CLS Working Paper Series.